The AAC Blackout Muzzle Brake is a highly efficient and effective brake designed to significantly reduce recoil and help keep shooters on target for faster shot-to-shot recovery. 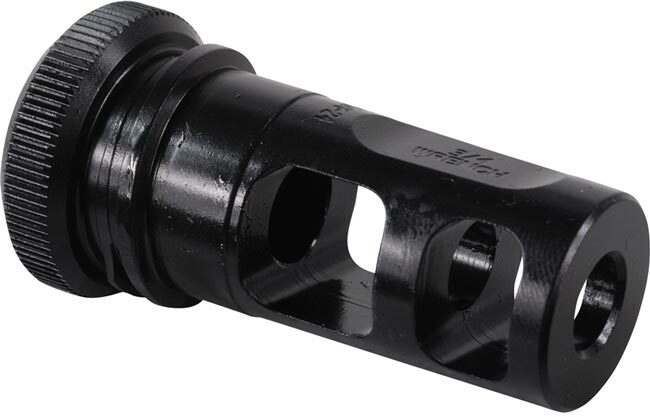 All Blackout muzzle brakes are machined from high strength aerospace 17-4 stainless steel alloy and coated in a hard, durable, corrosion resistant SCARmor finish. This 90-Tooth Blackout muzzle brake works in conjunction with AAC'sNon-Tapering Ratchet Mount designed specifically for use with the MK13-SD Silencer. The new90T gear on the brake interfaces with a spring biased ratchet lever on the suppressor to eliminate the potential for the silencer to inadvertently unthread during firing, while a finer pitch external ACME thread snugs it up securely to create a rock solid platform. NOTE: This brake is designed specifically for use with AAC's MK13-SD Silencers, and is NOTcompatible with other 90-Tooth Silencers such as the SR5 or SR7.